The oral health is affected by the food choices of modern people. Unfortunately, the bad choices they make is the reason why nowadays tooth decay is present a lot. Dr. Weston Price, a dentist very respected, claims that the tooth decay starts inside the body. Phytic acid is contained in seeds, beans, grains and nuts and it was established that this acid can be problematic. Phytic acid is a form of acid that contains phosphorus and is found in plants. It is commonly found in some seeds and grains. Obviously, this acid contains phosphorus, a mineral that has a molecule similar to a snowflake. The bio-availability of the mineral is not immediate in humans and one-stomached animals. Apart from preventing the immediate availability of the mineral, the molecule of the acid (phytic acid), which has a specific form, which is suitable for attaching to other minerals that are important like magnesium, zinc, iron and calcium, preventing their use. When the phytic acid binds to these elements it turns into a phytate. This acid is not focused only on binding to essential minerals. It blocks the enzymes that digest the consumed food, like pepsin for example that is an enzyme which dissolutes the proteins in the stomach and the enzyme which is required for dissolution of starch. That is amylase that converts starch into sugar. Phytates also bock trypsin, an enzyme that digest the proteins that are found in the intestine. Many scientists have observed the reactions of the body in people who follow nutrition packed with grains packed with phytates and revealed that this kind of diet has anti-nutritional effects that are so strong that contribute to many issues connected to the health as tooth decay. That is why many people use homemade and natural toothpastes to abolish the negative influence of phytates. The only disadvantage of these toothpastes is that they leave stains on sinks so you will have to clean the sinks regularly. In addition, people like to use different clays for healing, but when this kind of clay is combined with coconut oil it gets a specific texture that is hard to use and clean after use. Eventually, it is recommended by some people tooth powder that is designed specially and gives results that are excellent. Preparing this powder is better than a homemade toothpaste. Also it is better to use herbs and spices instead essential oils that can cost a lot. 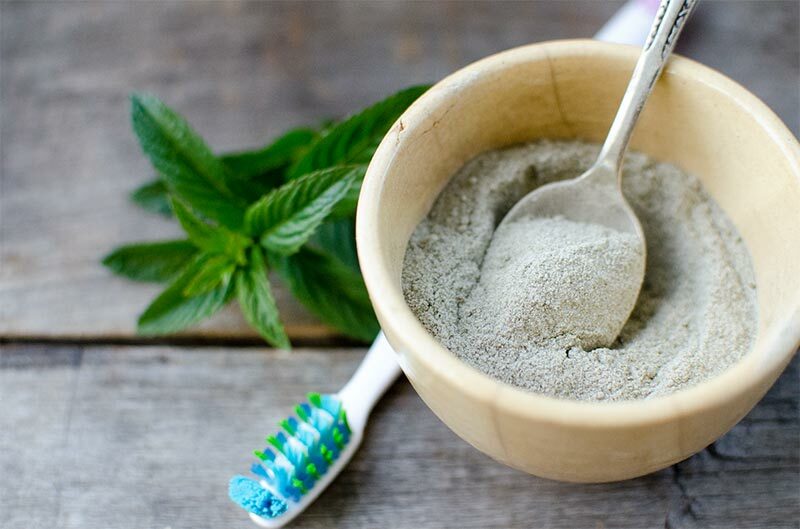 Bentonite clay is the elementary ingredient in this tooth powder which is natural and people are using it in different home remedies as a results of the efficiency it has. Bentonite clay has the ability to attach to toxins and heavy metals and remove them from the body. On top of that, this clay contains different kinds of minerals and is alkaline. It is safe to keep bentonite in the mouth and remove the toxins from the oral cavity. It is loaded with magnesium, calcium and silica and as we all know, these minerals are great for the health of our teeth. According to many experts, bentonite is an extraordinary compound because when it gets hydrated, the molecular and electrical parts of this clay quickly alter and create a small electrical charge. The best part about bentonite clay is that it can absorb toxins, heavy metals, impurities and similar pollutants of the bodies of modern people. The clay has a structure that aids the efforts to absorb and attract and elements that are toxic on the outer side of its wall and moderately drag them towards its center. In other words, bentonite is a clay that swellts. Once we mix this clay with water, it will swell right away. The reaction is similar like the one triggered by sponges. Afterwards, elements that are the toxic are absorbed. That is done by electrical bound and attraction. Bentonite clay is soft and can be used by children. People use this clay for preventing hair discoloration, mask s for the face and cures for inflammation. Baking soda is packed with minerals and alkaline. In addition, it eliminates stains. Two tablespoons of powdered mint leaf (you can replace with any essential oil). Use a food processor, blender or coffee grinder to powder mint leaves. Essential oils are optional. You can use spearmint, peppermint or cinnamon essential oils. Take all the ingredients, put them in a bowl and mix them well. You can use a mason jar too (pint size). Store the mixture in a clean glass jar with a good lid. Use a spoon to mix the ingredients and get a mixture with even texture. You will get a ¾ mug of tooth powder which is special and will last for a longer period of time. This powder last long because it doesn’t have ingredients that are liquid and the ingredients are antibacterial. Keep in mind that the herbal components are optional and you can replace them with other herbs. Both baking soda and bentonite clay can work together or alone for this purpose. Do not hesitate to put larger amounts of cloves, mint and cinnamon so that the powder gets more concentrated. Wet your toothbrush and place it in the powder. Brush slowly and gently for 2-3 minutes. Use cold water to rinse the powder. You can use it once or twice a day. This powder is perfectly safe for people of all ages. Brush your teeth with tooth powder. You can also use re-mineralizing toothpaste. Use charcoal powder (activated) to brush your teeth and eliminate bacteria, get rid of toxins and make your teeth whiter. This procedure should be performed 3 times a week. Perform this procedure one time or two times per day.